If your hostid number is blank, it is because GAUSS must be installed in a location in which the user has read and write privileges. If the user does not have sufficient privileges, the hostid number will return blank. - To generate a hostid number, please click here. 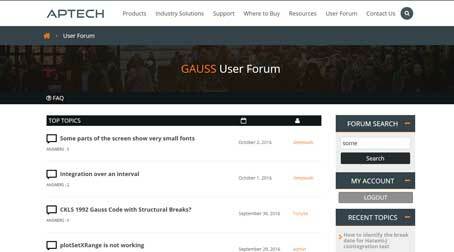 - We recommend that GAUSS 19 be installed at c:\gauss19 for Windows and /Users/yourname/gauss19/ on Mac. - We do NOT recommend installing GAUSS 19 under your c:\Program Files\ or c:\Program Files(x86) folders due to potential permissions issues. If you receive the following error message, it normally is because the hostid number used in your license file is different from the actual hostid number of your computer. Press the "Copy" button on the error message pop-up next to the Host ID line. This will copy the hostid number into your computer's memory. Locate the Email from Aptech that sent you your License File (OR press the button that says "Request License"). Select "Reply" in your Email. Type CTRL-V [Mac: CMD-V] to paste the hostid number into the body of the Email. Press the "Screenshot" button on the bottom of the error message pop-up. This will copy the entire error message. Type CTRL-V [Mac: CMD-V] to paste the screenshot into the body of the Email. Send the Email to Aptech License.